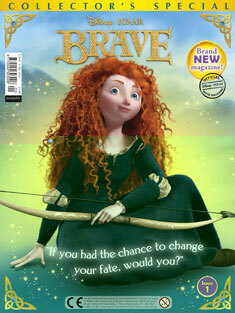 Egmont has just launched a new Disney•Pixar title, Brave, to tie in with the new animated movie. Described as "a grand adventure full of heart, memorable characters and signature Pixar humour", Brave uncovers a new tale in the mysterious Highlands of Scotland where the headstrong Merida (voiced by Kelly Macdonald) defies an age-old custom and inadvertently unleashes chaos, forcing her to discover the meaning of true bravery before it’s too late. According to Egmont, Brave Magazine will take readers further into the Highlands of Scotland and introduce them to all the colourful characters in Merida’s life; from her larger than life father King Fergus, her mother Queen Elinor and mischievous triplet brothers, to the unruly and uproarious lords of neighbouring clans: Lord MacGuffin, Lord Macintosh and Lord Dingwall. On sale in all major retailers, the new magazine, featuring stories, fact files, puzzles, activities, drawing and colouring, it's aimed at girls aged four to eight. The magazine will be on sale every four weeks and has a launch cover price of £3.99, dropping to £2.99 from issue three onwards. The first three issues carry covermounts including a Merida dress-up set of slippers & pendant, nail varnish, lip shine, bracelet and hair-bands. “We are delighted to be extending our collaboration with Disney and bringing this new magazine to market," says Debbie Cook, Director of Magazines at Egmont Publishing Group. "The film is fantastic and we are confident our content will deliver fun stories, games, dress-up and play value, extending the brand experience for fans. "We are really excited to be adding Brave to our leading primary girls portfolio."